(Canada) Prove it to yourself! Which one will you choose? Ideal for everyday use, Purex® 2x Ultra regular liquid detergent penetrates deep down into fabric fibers, removing ground-in dirt and stains. 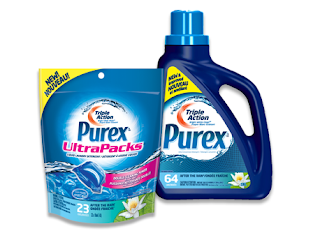 New Purex® UltraPacks™ contain a complete load’s worth of concentrated liquid laundry detergent in each convenient pack. They dissolve quickly, even in cold water, releasing the concentrated liquid laundry detergent. Note: You are allowed to request one sample per household per 12 months for promotion. Allow 6 weeks to receive your sample. Offer available while supplies last. Limit of one request per household address. Connect with us on the Purex Facebook page! Become a fan to share opinions, receive our latest news, and access exclusive laundry tips and money-saving offers. Sign-up for the Purex newsletter to receive great offers and learn about the benefits Purex can offer your laundry. When the site asks where you heard about them, say friend/family, not a freebie site. Right-clicking and copying the link location & pasting it in a new browser, rather than clicking the link can help too. Sometimes they won't send if they know you came from a freebie site. It will not let me get a free sample cause it will not take my zip code. It says US but its not even giving that as a choice. It needs to be fixed or changed to not include the US.